Isn’t everyone on HBO’s beloved “Game of Thrones” a talker? It’s arguably the most defining quality of what makes an HBO program “Not TV”—the willingness to allow characters to talk and talk and talk without concern over the traditional plot requirements of the four-act structure of network drama. The greatest HBO shows—“The Sopranos”, “Deadwood”, “The Wire” (and “True Detective” is certainly in this vein as well)—redefined viewer expectations. “The Sopranos” was a mob show, a traditionally action-driven genre, in which the best scenes in multiple episodes over its run were character-driven dialogue exchanges. While the plotting on David Milch and David Simon’s shows was certainly notable, both shows thrived because of the verbal gifts put in the mouths of their favorite characters. Milch created poetry of the guttural, and we reached a point where we cared what Al Swearengen was going to SAY as much as what he was going to do. It’s impossible to overstate how unusual that is for a medium that was built on urgent plotlines that needed to be wrapped up before the final commercial break. And, watching the first few episodes of the new season of “Game of Thrones”, one is reminded how much this remarkable program fits in that dialogue-driven aesthetic and helps fuel that expansion of what we’ve come to expect from TV. “Game of Thrones” is one of those programs for which mentioning much plot at all sends fans into fits. And so I will be very vague with spoilers but I can tell you that fans of the books know that this 10-episode season is going to make the Red Wedding look like a “Real Housewives” reunion. The tone of foreboding horror that has blanketed the show for years now has grown even denser. Winter isn’t just coming, it’s going to slit your throat and throw your relative in a dungeon to be castrated. And yet what I find so incredible about the start of season four is that there’s a tonal balance within that dread. We still get wonderful moments of humor (mostly from Tyrion and Arya and The Hound) and exquisitely rendered fantasy even as every scene of gloriously scripted dialogue feels like it could end with a disemboweling. In terms of plot, more of the characters seem to be hanging at King’s Landing than ever now that Jaime Lannister (Nikolaj Coster-Waldau) has returned, hoping to rekindle his affair with his sister Cersei (Lena Headey) but unaware of how much has transpired since he’s been gone. Tyrion (Peter Dinklage) is begrudgingly married to Sansa (Sophie Turner), still fighting orders from his father Tywin (Charles Dance) to go forth and multiply. I love how often the writers refuse to hold your hand even across seasons as Tyrion’s lover Shae (Sibel Kekilli) is trying to figure out her place at King’s Landing after being essentially ordered to leave at the end of last year. The “Game of Thrones” writers don’t just allow plot threads like that to untraditionally cross seasons but will set things up early in one season that don’t pay off for over a year. Back to our massive cast. The increasingly-powerful Daenerys Targaryen (Emilia Clarke) is continuing to stretch her leadership as her dragons and army grow. Arya (Maisie Williams) is stuck with The Hound (Rory McCann) on a road trip from Hell. Theon (Alfie Allen) has been reduced to almost nothing. Bran (Isaac Hempstead-Wright) is having increasingly dark visions. Jon Snow (Kit Harington) works toward a leadership role he’s seemed destined to hold for seasons. All of this leads up to another nuptial between Margaery Tyrell (Natalie Dormer) and Joffrey Baratheon (Jack Gleeson) as the fallout from the Red Wedding hangs in the air. A ton of plot, right? And yet I have advised so many people who claim that they can’t follow the numerous threads on “Game of Thrones” the same thing—stop trying. Enjoy the moments; identify with the beats instead of the overall picture, and trust that it will come together for you. I started to love “Game of Thrones” when I gave up on figuring out how it all connected. Again, HBO is changing how we experience and appreciate television with a commitment to character that matches the art direction, costume design and special effects, the traditional hallmarks of the fantasy genre. 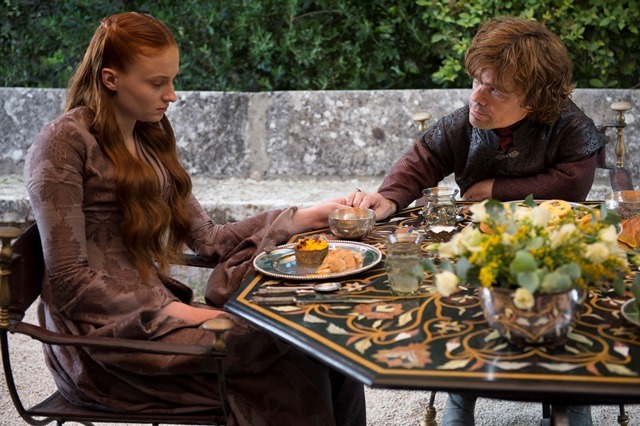 While Daeny’s dragons look amazing, my favorite scenes in the premiere are a heartfelt dialogue exchange between Tyrion and a devastated Sansa and the verbal interplay between The Hound and Arya. As they have for three years, the blend of function and character within the dialogue is breathtaking. One of the best shows of the last several years feels as creatively vital as ever. Speaking of verbal acuity, it’s the engine that drives Armando Iannucci’s hit comedy about Selina Meyer (Julia Louis-Dreyfus), the current Vice President who is mounting a run for the only office above her over the course of the first five episodes sent for review. It was a brilliant narrative move to shake up Meyer and her crack staff with the promise of the Presidency as it allows each of these self-centered nuts a chance to crank up their intensity now that a life-changing run is in their faces. Want to make an intense political player more intense? Show them the potential of a better job. And so the malice, greed, and general insanity on “Veep” feels amplified this season, mostly for the better. On a foundational level, the narrative of season three allows the writers to get their characters out of the office. The season starts with Meyer on a miserable book tour and progresses to poorly staged public appearances and a hysterical appearance at a Silicon Valley company to get campaign promotion. In fact, the characters of “Veep” are almost always on the move in season three, scrambling to head off the next piece of bad press that could come around every corner on a campaign. It gives the show a notable energy that this incredible cast feeds off at every turn. Louis-Dreyfus can still sell an uncomfortable political smile like no one else. I will say that the tone this season seems somewhat unnecessarily darker at times than in the first two (which may be hard to believe but trust me). Dan (Reid Scott) has gone a bit off the mental reservation in his desire to be Selina’s Campaign Manager, going as far as assaulting Jonah (Timothy Simons) at one point. And about Jonah: he worked better in smaller doses in the first two seasons, a scratching post for Dan and Mike (Matt Walsh). He has a bit too much narrative in season three as his adventures into the world of political blogging threaten to ruin Meyer’s run. These are minor complaints for what is still a very funny, smart show. The third and fourth episodes, which center around how carefully-planned a campaign speech has to be to hit all of the right special interests and the aforementioned trip to a Google-esque company, respectively, contain some of the sharpest political satire of the year. I wish I could say that Mike Judge’s new comedy felt half as sharp as “Veep”. There are times when it promises to live up to its satirical potential as a modern “Office Space” for the tech movement but it presents viewers with too little to latch on to in terms of character. It improves in that department by the third episode but I’ve always been hesitant to tell viewers to give a show that much time to develop in today’s market of immediacy. And even though it improves, I still find as much about “Silicon Valley” frustrating as I do funny. Thomas (Thomas Middleditch) works at an incubator deep in the valley that’s run by the obnoxious Erlich (T.J. Miller) and manned by a few other young tech developers: Dinesh (Kumail Nanjiani), Guilfoyle (Martin Starr), and Big Head (Josh Brener). As so often happens, these technological drillers strike oil when Thomas develops a remarkable compression program that becomes the target of a bidding war. “Silicon Valley” has some very solid laughs but traffics in stereotypes that feel outdated—the nerd who can't even look at a girl much less talk to her or touch her, the young businessman who literally shakes when faced with career potential. When it gets broad like that, especially countered against the character-driven realism of other HBO shows, I get annoyed. And yet the characters aren't dense enough to hold the show together otherwise, which has me sometimes longing for the more sitcom-ish set-ups. And so there's this odd push and pull; I want the show to be more realistic but I don't care about these characters enough when it chooses to be so. Both sides feel underdeveloped, a fact that’s exacerbated by Mike Judge’s weakness as a director (he’s always been a strong writer but clunky visually). I think “Silicon Valley” is damaged further simply by being on the same night as two of the current HBO greats. This start-up still has some creative work to do.